Cauliflower pizza is definitely “in” right now and it’s easy to see why. This is a healthy and easy recipe and, even more importantly, it tastes AMAZING! Why is cauliflower pizza healthier? 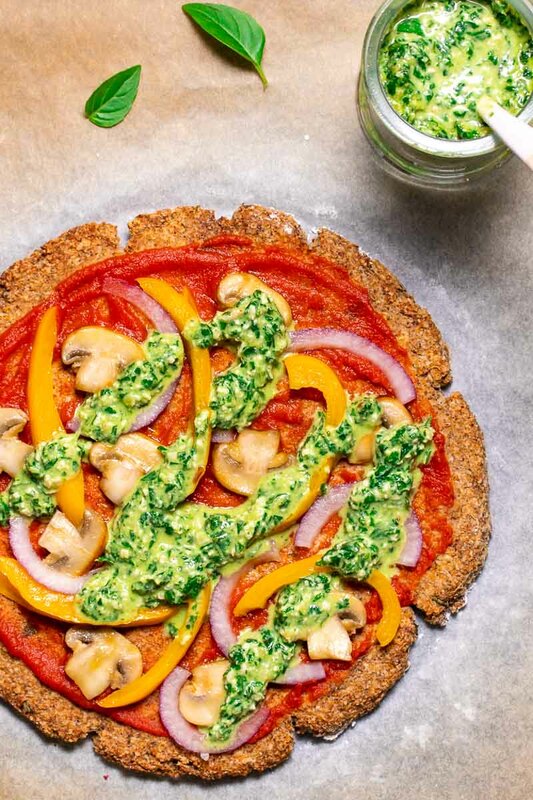 If you add healthy toppings like fresh veggies or mushrooms, this vegan cauliflower pizza becomes a true powerhouse of healthy and delicious nutrition! Step 1: Grate the cauliflower (or use a food processor) to make cauliflower rice. Cook the cauliflower rice in boiling water for 5 minutes to soften. Once it has cooked and cooled, squeeze as much excess water as possible out of the cauliflower rice using a kitchen towel, paper towels or cheesecloth. Tip: You can buy cauliflower rice ready to use so you don’t have to grate a cauliflower head. Step 2: Mix flaxseed meal and water into a ball and put it in a large mixing bowl. Add the drained cauliflower, almond flour, oregano, onion powder, sea salt, and chopped basil leaves. Step 3: Mix everything into a firm dough and shape it into a circle on a baking sheet. It should be about 1/2 inch thick. Step 4: Bake the crust for 30 minutes at 375°F (190°C). Step 5: Add a thin layer of tomato sauce and your chosen toppings and bake for another 10-15 minutes until the edges are golden brown. 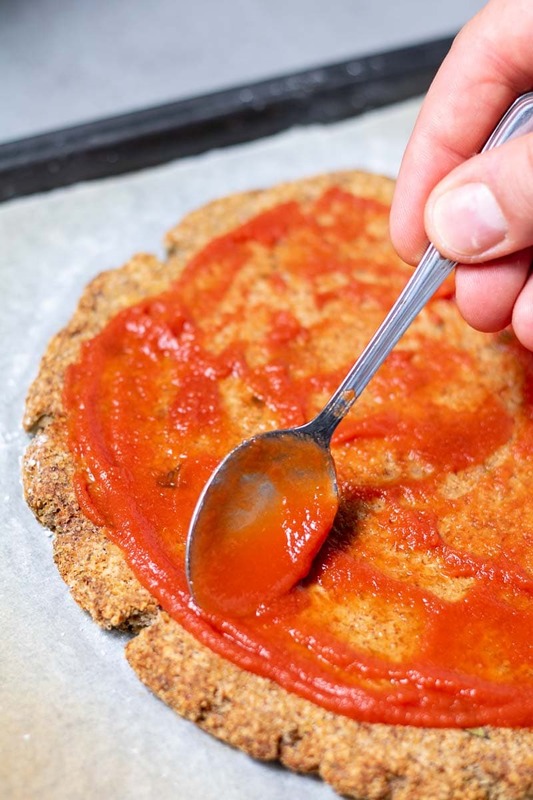 Tip: Don’t use too much tomato sauce or wet toppings to avoid the crust going soggy! Step 6: Top the freshly made basil pesto on top and serve right away (see instructions for making basil pesto below). This is it! It may take longer than ordering a pizza online, but this vegan cauliflower pizza also tastes a lot better than anything you can order. And it’s MUCH healthier! If you’ve never made a pesto of any kind before, don’t stress because pesto is always super simple to prepare and can be used in so many ways! 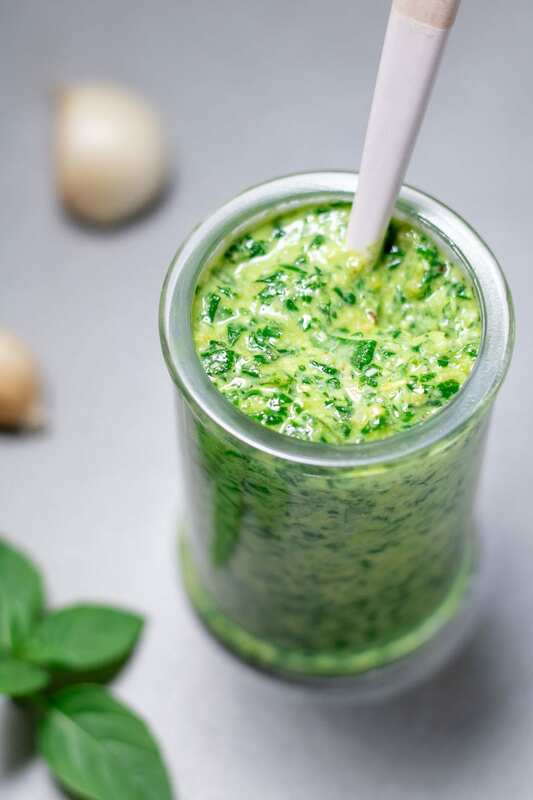 To make the basil pesto, simply put all the ingredients into a food processor and process until the desired consistency. That’s it! Your basil pesto is ready. For this recipe, the pesto can be altered to fit your tastes very easily. To make the basil pesto oil free, you can substitute the olive oil with vegetable broth. I added a bit of water to the pesto as well to make it spread over the pizza easily. If you don’t have pine nuts in your pantry and you need a good substitute, you can use walnuts instead. They have a similar taste to the pine nuts while still giving the pesto a rich and creamy taste. Tip: You can use leftover pesto in many creative ways. It works perfectly as a pasta sauce, as a dressing on salads or as a tasty garnish for roasted vegetables. Sautéing your toppings before putting them on the pizza will help release excess moisture and keep the base crunchy. You can change the taste dramatically by adding herbs or spices to the cauliflower dough. Cauliflower absorbs strong flavors like chili or garlic very well. 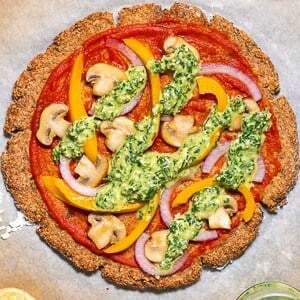 Can you freeze and store cauliflower crust? YES! And this is one of the things that make it awesome. After the first 30-minute bake, you can put the crust in the fridge or freezer in an airtight container. Just let it cool first. Then when you are in the mood for pizza, you just need to take out the bakes cauliflower pizza crust and add your favorite toppings before baking for the final 10-15 minutes. Freshly baked pizza in less than 20 minutes! I have also collected a list of my favorite low-carb cauliflower recipes that I always keep updated when I publish new recipes. 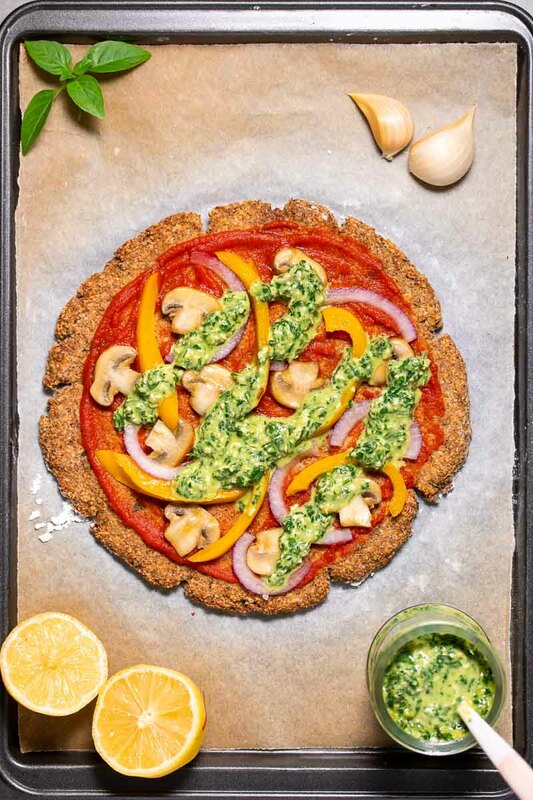 When you’ve tried our vegan cauliflower pizza with basil pesto, please don’t forget to let me know how you liked it and rate the recipe in the comments below! This vegan cauliflower pizza is the perfect alternative to a traditional pizza! With a delicious cauliflower base, you can indulge in some pizza anytime! 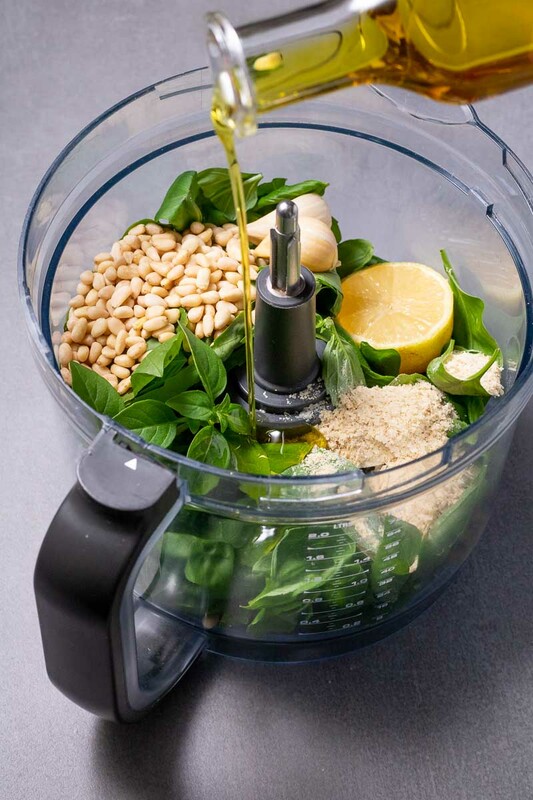 Add all of the ingredients for the basil pesto into a food processor and process until they come together. Add some water if the pesto seems too dry and isn't mixing smoothly. Preheat your oven to 375 F (190°C). (If you have readymade cauliflower rice, you can skip this step.) To make cauliflower rice from scratch, take the head of a large cauliflower and cut into smaller florets. Grate these florets using a box grater with medium-sized holes. You can also use a grater attachment on your food processor to make cauliflower rice instead. Bring a large pot of water to the boil and add the riced cauliflower. Mix and cook for 5 minutes until the rice is soft. Drain the cauliflower rice with a fine mesh strainer or a kitchen towel. Once most of the water has drained, set the rice aside to cool for 5 minutes. While the cauliflower rice is cooling, mix the flaxseed meal and water and form it into a ball. Set aside. Wrap the cooled cauliflower rice in the dish towel and ring out as much water as you can. Put the cauliflower rice in a large mixing bowl. Add the prepared flaxseed ball, almond flour, oregano, onion powder, sea salt, and chopped basil leaves to the mixing bowl. Combine the ingredients thoroughly using your hands. Taste the mixture and adjust the saltiness and flavor as needed. You can add more onion powder or basil leaves for more intense flavor. 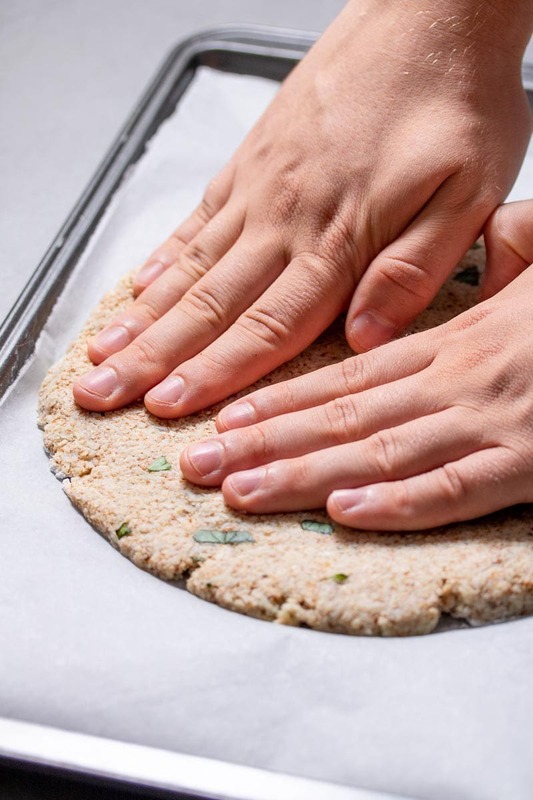 Spread the dough on a baking sheet dusted with gluten-free flour and shape into a circle. It should be roughly 1/2 inch (1.5 cm) thick with slightly thicker edges. Bake the crust for 30 minutes and remove from the oven. Add a thin layer of tomato sauce and your chosen toppings to the base. Bake for a further 10-15 minutes until the edges are golden brown and the base is cooked through. TIP: Don't use too much tomato sauce or the pizza will get soggy! Spread some of the freshly prepared basil pesto onto the pizza and serve hot.